Welcome back to I’m Right, You’re Wrong, where I present a situation and ask you to weigh in. To preserve the integrity of the responses, I don’t reveal which side I’m on, due to the ego-maniacal and delusional belief that everyone would rush to agree with me. A few months I was peeling an orange and a co-worker said “ooh! An orange! 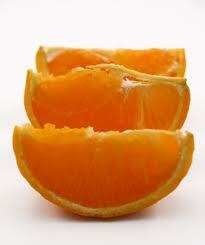 I love oranges!” so because I’m not a savage, I offered her a few sections and she happily accepted. The next time I was peeling an orange, I offered her some again and she said “no thanks.” But then the third time she accepted. The next few times were a “no” followed by a sudden “yes”. There doesn’t seem to be a pattern to her orange acceptance/rejection. I’m guessing it’s diabolically based on whether she “feels like” having an orange. Dilemma: Am I obligated to offer this person orange sections for the rest of my life? Should I be eating oranges in the bathroom so no one can see? When does orange season end, anyway, so that I can transition to non-sectioned, unsuitable for sharing fruit? Disagreers: Marinka and a friend. Position One: Once the pattern of offering has started, there’s no way to stop it without it being some kind of a statement. So until the last orange has been eaten, keep offering sections! Position Two: This is insanity. She’s probably accepting because she feels pressured to. Stop offering. The scurvy epidemic is over. First instinct: stop offering. Second instinct: if you must, maybe stop offering by tapering off… offer every THIRD orange, then every once in a while orange, then only if she comments that she would really love some of your orange today. meh – screw’em. if they’re too wishy washy to know whether or not they enjoy oranges on a consistent basis, no need to offer. and plus, how many sections of orange are there total? I count on clementines and it’s usually about 9-11. (I’ve got clementine centric OCD). so if you’re dishing out even 2-3 sections per accepted offer, you’re dealing out over 20% of your snack for someone who may, or may not, actually appreciate it! You’ve never offered me an orange. You should start actively asking for some, Wendi. She’ll be to embarrassed to say no. Stop eating oranges. Change jobs. M: Would you like a piece of the orange? M2: Would you like a piece of my orange? Me: [thinking: oh, no, I hope she doesn’t think that I am some kind of homeless person with no access to oranges. What if she thinks that I was looking at her like I want an orange but don’t have one of my own? But if I say yes, it’ll look like I need orange charity.] No, thanks! M3: Would you like a piece of my orange? Me: [thinking: what if she likes sharing the orange because she doesn’t want all the orange-calories? What if we’re now friends and I’m trapped forever in a relationship of orange-sharing and if I say no, she’ll hate me forever!” Okay, sure! So anyway, I would say that you stop offering. You can’t keep her supplied in oranges for the rest of your life, what are you, Florida? And there have been some good ones on here! I would say, she’s not accepting every time, so why should you worry about offering every time? If you feel like sharing, offer. That way the cycle of irregular orange offerance/acceptance is reciprocal. Grand Pa Freud said once: Sometimes a cigar is only a cigar. Do not offer anything to anybody and you will be safe. Stop offering. If she ever says, “You never offer me oranges anymore” you can blame it on Papa and say, “I’m sorry. My dad won’t let me.” That’s what my dad always told me to do if anyone ever offered me drugs. Blame it on him. I can’t help but wonder what would happen if you brought in a cut up apple. And if perhaps this situation is exactly how the phrase “it’s apples and oranges” originated. Eat it really fast when she runs out for coffee. And then tell her that sweet nectar scent in the office is your new body mist. If she stares at your orange and salivates, offer. If not, don’t. If she is a good enough friend to accept orange segments that you’ve touched, she shouldn’t be shy about asking when she wants a bit. What?! I wash my hands and everything. I didn’t think that accepting an orange that I’ve touched involved heroism on her parent. Although to be fair, she’s no Howie Mandell. Why in the world would you be obligated to give her part of your orange? It’s your orange. If she wants an orange, she’s a big girl and can buy her own damn oranges. You are very generous to keep offering, but it is in no way an obligation. I side w/Position Two — she is probably regretting she ever said she LOVES oranges. I love how I’ve been reading this blog for like 2 years and my first comment is on the orange debate. I just know something about it because I work in a tiny office with only one co-worker so basically anytime we eat or drink, the sharing/not sharing thing comes up. My view is since it’s brought from home, offering to share means the person isn’t hungry enough to finish it or for some reason has extra, so they are sharing. When it comes to purchased meals, that’s different. If you usually buy coffee for your co-worker, and then one day come back with only coffee for yourself, *that* feels insulting. I once bought an Almond Joy in the presence of another comic. She knew, and I knew, and everyone knows that the Almond Joy has 2 pieces. So she asks me if she can one of the pieces. Get Almond Joys and I guarantee you won’t offer or if she asks, you’ll say no. Unless, of course, you hate Almond Joys and then we can’t be friends. I say just stop offering the orange! Once you started it… Then again I am plagued by this sharing buissnes in my son’s life so I am ingrained to say so. How about you bring two oranges. Maybe the ‘I buy lunch, you buy lunch’ insanity replaces continuous partial sharing of an orange you put your labour into peeling as well. See, taking turns. Now I feel like I am talking to my son. Signing out, before this turns into a lecture. I just don’t share food. Especially popcorn. I give the best death stares if you so much as try to take ONE itty bitty piece of popcorn from me at the movies. I also don’t share my fries, or ice cream. I hate when people say: “No, I’m not going to get my own, I”ll just have some of yours.” NO YOU WILL NOT, DAMN IT! Is anyone else really hungry for oranges? I would start asking her for part of her lunch. I’m with opinion 2, mostly because I seem to be feeding apples to 5 kids in junior’s kindergarten. Daily. Because kids just ask. Have you any idea how much apples cost here? Not 1967 prices, are they? Stop offering. Obviously she is capable of broad hint-dropping when she really wants part of your snack. Important note: I have no friends in my office. The thought of you taking your oranges into the bathroom is sounding off my OCD alarms. Don’t do it! Worlds colliding!! My guess? The first time, she was really hungry or really sun-deprived. Both of which make the smell of oranges wafting through the air irresistible. So she basically asked for some in the most polite way possible by noticing their goodness and hoping you’d offer. After that, you just kept offering and because she is not a savage and doesn’t want you to think she doesn’t like you or like your oranges, she occasionally accepts out of politeness. Stop offering. She will be relieved. I was going to say, it’s polite to offer and you should never eat anything in front of someone else if you can’t / won’t share. (You can thank my mother for that one.) However, having read the other comments I think I am going to be more balanced and say, only if she seems to be focusing in it and looks like she really wants it, otherwise it is your lunch, enjoy it. I have to go with position two…mostly because I like the word scurvy. My ex-co-worker used to ask me for a piece of my orange every.single.time I ate one. I actually found it *really* annoying. But she kept asking, so I kept giving her some. I mean, really? You want oranges so bad, just go buy yourself one. She used to joke that I should bring 2 oranges to work so she could have one. I wanted to beat her in the face with a bag of oranges. Not really the same situation, but it’s about oranges so I felt it was necessary. Side two makes no sense because you indicated that she has sometimes declined your offer. Obviously she’s not afraid to say no! So! It’s the secretary with the candlestick in the library! Has she ever offered you anything? That’s what I thought. Stop offering, like everyone else said. She’s obviously comfortable enough to ask when she wants some! So why are you taking upon yourself to offer? I say switch to a fruit that would be just awkward and bizarre to share, like a banana. When you offer it, while chewing a bite, she’ll ask HR to move her office. I am a youngest child. I don’t share. Except w/ my dog, b/c every time I peel a stinking banana, she can hear me and she comes running, giving one of those, well, puppy dog faces. I’d stop offering, but then I’d be worried that she felt like I was snubbing her and flaunting my oranges. Then I’d be really uncomfortable about passing her in the hallway or running into her at the coffee pot. Then I’d start hiding the oranges under my desk until people started asking questions, at which point I’d likely switch to something entirely unlike oranges. Like cough drops. On a side note, my husband had a roommate once that had scurvy. Ahh university. Stop the MADNESS! You are in no way obligated to keep this woman’s Vitamin C at recommended levels. The first time you were being nice and polite, which is fab. But damn, if she loves oranges so much, you’d think she’d bring in a few herself, no? So stop it. Please. Running into the bathroom to eat food is something that should be reserved for parenthood situations only. Lick all the sections in her presence before offering them one more time. You’ll have your oranges all to yourself from that day forward. No guilt, no wondering. Stop eating oranges. Switch to other sectioned fruit like grapefruit or limes. If she still corners you and says she likes them, you’ll know you have a citrus stalker on your hands. Stop offering. If she wants she can ask, or get her own. Position #2 – without a doubt. If and when she ever wants one again, she can ask. Or start bringing apples. What I noticed is that there were a whole bunch of comments that never once mentioned bananas, and then a whole bunch of banana comments right in a row. It seemed a little suspicious–like the Chiquita lobby swarmed your comment thread. Now you’ve made it clear that the offer stands, but that you’re not going to keep asking. Maybe you should secretly eat your orange in the toilet. Because that wouldn’t make you weird and insanitary at all. Or maybe you should take an extra orange next time, to make a point of now wanting your whole orange to yourself. It’s time to wean her. Really. My understanding is that oranges are a gateway fruit. If you don’t stop offering now, where will the insanity end? !